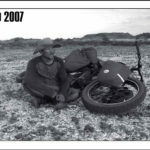 Jakub Postrzygacz traveled 1,250 miles on a Surly Pugsley through western Australia to become the first person to bicycle the infamously difficult overland route entitled the Canning Stock Route. Three deserts, hundreds of miles of sand dunes, and grassland. Riding between life support giving well water sources Postrzygacz finished the route in just 33 days and he did it all unsupported. Photo: from the cover of the 2007 Surly Bikes product catalog. By submitting a comment you grant samhDOTnet a perpetual license to reproduce your words and name/web site in attribution. Inappropriate and irrelevant comments will be removed at an admin’s discretion. Your email is used for verification purposes only, it will never be shared.